The blood pooling in my feet has been quite spectacular for a few days now. 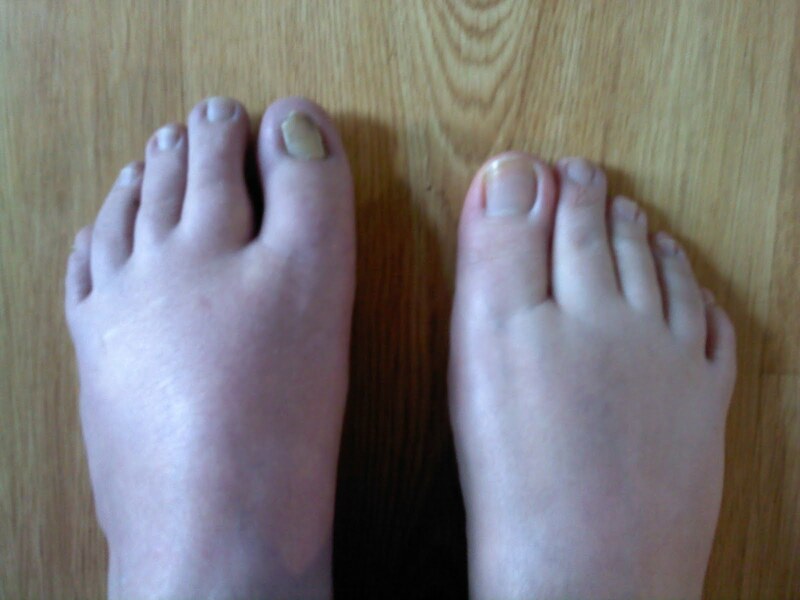 So I thought I would share a picture of my revolting tootsies! The left foot has been allowed to dangle for five minutes the right foot has been elevated during the same time. I would have tried to last a bit longer but my foot started feeling prickly! So now you can see the various colours my lower extremities go when not elevated. ← Life being conducted from the confines of my bed! Bipolar Bear shambling by from France to say – hang on in there kid, the rest of us are rooting for you! That does not look pleasant. Get those feet up! Thank you so much for leaving comments. My blog has gone crazy today due to shameless self promotion! I thought I would post the picture as its very difficult for people to get their heads around when I say blood pooling. I mean what does it mean to the average person…..for me before all this probably someone just moaning about nothing. Have some more interesting pics to post just summoning up the courage.